It is Monday. Shall we detox on something healthy? This meal was all over the place. I was thinking of making a Greek dip-ish. Then I was thinking Greek pizza-ish. I ended up with a sort of open-faced Greek “un”Wrap. 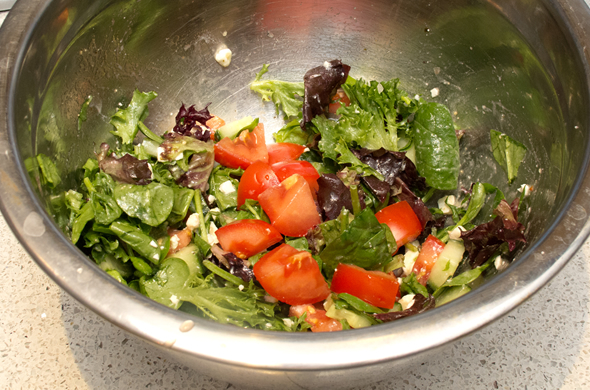 Assemble the salad by mixing the lettuce greens, chopping the tomato, chopping the onion, chopping the cucumber. Mix in salad dressing and feta. Heat a skillet over medium heat. It should be sized to fit the pita pocket. Once hot, add 2 tbs olive oil to the pan then add the pitas one at a time, flipping once. 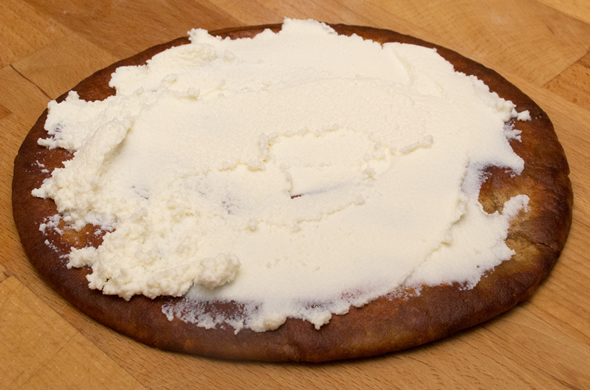 Spread half the ricotta onto each pita pocket. Top with salad mix, then feta. Slice and top with grilled chicken. Drizzle some additional dressing over the whole thing or the creamy Greek dressing. I liked the crispness of the pita… toasting them up was in my best interest, since my pitas were not exactly fresh anymore. It was a great weird mix of not a salad, not a pizza. Not a pizza topped with salad. It was tricky to eat, but that’s a challenge I was happy to accept. This is a refreshing summer meal. I love that is has some great flavors, freshness, and uses only a few ingredients. There is only a small amount of chicken in/on this. Once again, it was a good reminder that those super skinny breast pieces are useful when cut up or one normal size chicken breast would easily serve 2-3 people this way. I had some green onions hanging around so those went on top too. I’ve proclaimed my love for ricotta, haven’t I? It is true. I love it. Ricotta on toast + avocado = delicious. I had leftover ricotta from making personalized Pizza Dip so I figured this was definitely a different use for it. Whipped feta would be great on this too. These would be fun on little mini pitas for an appetizer. 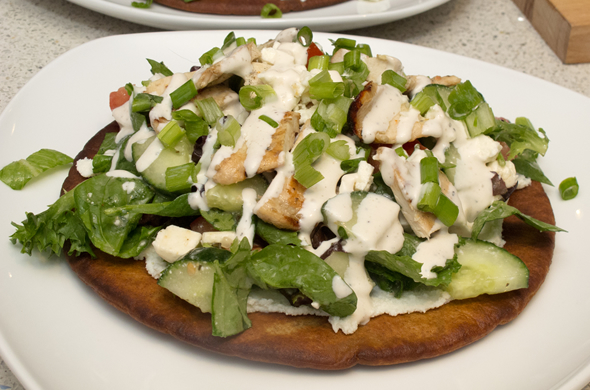 Pita bread is a great pizza crust. I need to do that again! I love Greek anything and this looks just lovely! YES. Detoxing this week is KEY. Love these!